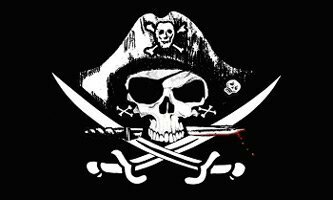 One of our Stylish and Intriguing Pirate Flags - Pirate flag: deadman chest tricorn design - 3x5, flag-fp-002-3x5 Light yet strong, durable polyester material. Measures 3'x5'. Brass spur grommets.